You have seen this many times; soft, liquidy poop found in a pile on the rug under the kitchen table. In this article I am going to go over the common causes of dog diarrhea, and how it is diagnosed based on the clinical signs. Lastly you will see the more common and most effective at home remedies to be able to stop your dog’s diarrhea fast. Anything that upsets the digestive tract and results in water not being absorbed produces diarrhea. Some common causes include dietary indiscretion (eating compost), parasites (Giardia or Roundworms), food allergy, infectious causes (Salmonella), inflammatory changes (Inflammatory Bowel Disease; similar to Crohn’s disease in people), and pancreatic abnormalities (Pancreatic insufficiency, common in German Shepherds). Diarrhea in dogs is categorized as being either small bowel diarrhea ( it originates from the small intestine), or large bowel diarrhea ( it originates from the colon). Small bowel diarrhea is generally large volume, not very frequent, at times with vomiting and weight loss. The causes of small bowel diarrhea are many, from parasites to infectious agents. Large bowel diarrhea signs include frequent bowel movements, straining, with occasional mucous and blood. Most large bowel diarrhea is classified as colitis, being caused by dietary indiscretion. Severe diarrhea that results in dehydration is a medical emergency and must be dealt with by your veterinarian. If you have a young unvaccinated dog the diarrhea may have an infectious cause; the dog must be examined by a veterinarian. If your pet is still very alert, active and drinking, then try some of the following home remedies. Pepto-Bismol is an old standby that can be effective for dogs. The dog dose is 1 ml/10 lbs of body weight given three times daily for no more than 7 days. Imodium (Loperamide) can be used with care, avoid giving it to Collie’s or Collie crosses. The dose for dogs is 0.5 mg/10 lbs three times daily (give your 40 lb dog one 2 mg tablet three times daily). Kaopectate has a newer version that is safer for dogs. It contains attapulgite clay as the active ingredient which binds toxins, decreases the fluid in the intestinal tract and subsequent diarrhea. Dose for dogs: 0.5-1.0 ml per pound by mouth every 4-6 hours. Treatment should only be needed for 1-2 days. There are a few herbs that I am finding helpful for dog diarrhea. Slippery Elm in the dried form can be helpful for chronic diarrhea, such as inflammatory bowel disease in dogs. The dried herb dose is 20 mg/lb of body weight twice daily. Peppermint helps with intestinal gas and cramping; give 25 mg/lb of body weight twice daily of the dried herb or 1 drop/lb of body weight twice daily of the tincture. 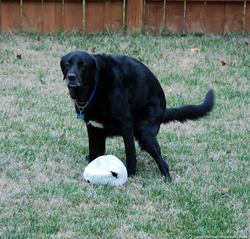 You now should have a good understanding of what the signs and symptoms of dog diarrhea. You should be able to differentiate between large and small bowel diarrhea, and now know when to seek urgent veterinary care, or try some of my suggested home remedies. Now you have a selection of home remedies to use the next time your dog gets diarrhea, and you can now stop your dog’s diarrhea fast at home. Thanks for all the great advice! I have your course and have used it more than once to save a trip to the vet. I love the online vet. I have gotten a lot of great tips from this forum. Unfortunately, my story of diarrhea in dogs took a fatal turn. I had a boxer who had diarrhea and parasites from the start. It took almost 4 months to get rid of the various parasites that he obtained from the breeder. We finally got him good. He always had intermittent diarrhea and the vet said it was probably from sneaking a bite of cat food on occasion. Well, I had finally had enough after about 2 yrs of this. I took our beloved boxer, Gunner, to San Antonio, TX to a vet specialty hospital and they performed a colonoscopy. He was diagnosed with a fatal fungul infection caused by Prototheca. We were hearbroken and he succumbed to seizures and nerve damage about 3 months later and we had to put him down. This disease, Protothecosis, is deadly and almost always missed in diagnosed. There are antifungals out there, which we had some specialy mixed up by a lab in Arizona, but we were too late to save him. Please, Please, if you have an animal with intermittent diarrhea….look beyond traditional excuses. Our beloved Gunner died way too soon and we were hearbroken. We just had a young pup die today. He was so sick. it hit so fast they couldn’t save her. I don’t use pepto because of all the crap they put into it. Instead, I use keopectate and it works like a charm, and so does adding slippery elm. Slippery elm coats the intestinal tract to protect the lining, so no more diarrhea and it also works for dogs with constipation because it lubricates the way out. Do you have any evidence for the effectiveness of homeopathic medicine?